Are FF in fact the Green Party’s mudguards? With the various commentary about the future of the Greens and how they might deal with it. Once the government goes to the country whenever that it, I was wondering are FF’s 2nd candidate TDs in fact the Green Party’s own constituency mudguards? It is frequently noted that the smaller party in government with FF ends up as it’s mudguard taking most of its flak and ultimately paying the price at the polls. But is that really the case for the Greens? Gogarty is given some space by the fact that the only FF had the votes last time to challenge for a 2nd seat and that wouldn’t be the case next time. With Harney likely to go FG will gain her seat and SF (who did better than even they expected with Joanne Spain given the ructions over her late adoptioj as the SF candidate) would be the main threat to Gogarty but it is unclear if they will repeat given the underperformance of SF across Dublin in 2009. Verdict: A probably hold. Sargent is still personally popular and again it is FF that is in poll position to take the first loss here not the GP (that would be a seat loss to the Socialist Party), and neither Lab nor FG appear to have high profile 2nd candidates in the field as yet. Verdict: A probable hold. Mary White – FF will certainly drop one and FG will get their 2nd here but it is Labour’s weakness (divided across the two counties and with internal division aside from that which were papered over for years by Seamus Pattinson’s holding of the seat) that could let Mary White back in on FF transfers. Verdict: A possible hold. 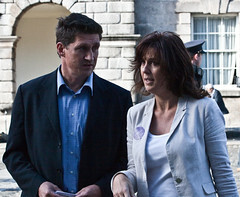 Eamon Ryan – with FF possibly going into the next election with not outgoing TD standing if Tom Kitt makes good on his threat/promise and the possibility (though don’t write off FG just yet) that Alex White will be a TD already. It is possible that Eamon Ryan could hold on, getting the last seat ahead of the 3rd FG candidate on foot of FF transfers from their eliminated 2nd candidate. Verdict: A probable hold. John Gormley – FG and Labour will be gunning for a 2nd seat, most likely at Gormley’s expense with Labour best placed to take it on paper and geography if cllr Kevin Humphreys is the 2nd candidate. But DSE is a strange place and many that voted for McDowell last time might give Gormley a vote with a view that he has been firm and placed a sticky wicket (I think that’s a game played down there) passably well. FF might decide to rope in Eoin Ryan to secure their seat if it looks under threat at the expense of Chris Andrews. Verdict: A possible hold. So were the opposition to (on the QT mind) not beat up on the Greens locally too much they could still come back with a few TDs and a party able to rebuild. This entry was posted in Uncategorized and tagged Fianna Fail, fine gael, Green, john gormley, labour, Richard Boyd Barrett, Tom Kitt. Bookmark the permalink. 4 Responses to Are FF in fact the Green Party’s mudguards? From a Green point of view your analysis seems optimistic. On DSE.. Am I correct in thinking that McDowell took what used to be considered a FG seat? Since Gormley only beat McDowell by 100 votes in 2007, I can see him having problems against a resurgent FG with no PD running. Added to that, DSE has no problem firing ministers. I think you could argue that McDowell took votes that might otherwise have gone to an FG candidate but we need to also remember that DSE (along with Dublin South, DL and at one time DNE) like to also vote for people they think of as being of ministerial calibre or even potentially Taoisigh irrespective of the party itself. Some of the voters in these constituency see themselves like the judges of a Politics talent show. So in the eyes of these folks, Gormley if he was seen as doing the right by the national interest, might be tempted to help him out, and thus compensate for the loss of votes on the left/radical side of things. SF must have a dart board with Mannix Flynn’s picture on it as Daithí Doolan would have been placed to soak up Gormley’s deserters. Sadly, it’s that bit harder for them with him off the city council. Eoghan Murphy proved he was box office for the locals and he might well challenge Lucinda for top spot (or simply result in her upping her game as she appears, to me at least, to have done over the last 6/12 months) but I would still rate Labour as better chances for a 2nd seat provided they select Kevin Humphries. If they go with Quinn/Bacik then that will favour FG’s probable ticket.